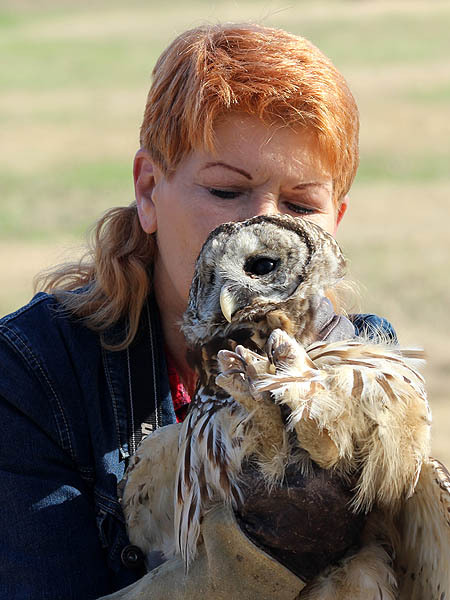 Wildlife rehabilitation is a labor of love for which the rewards are not always tangible. 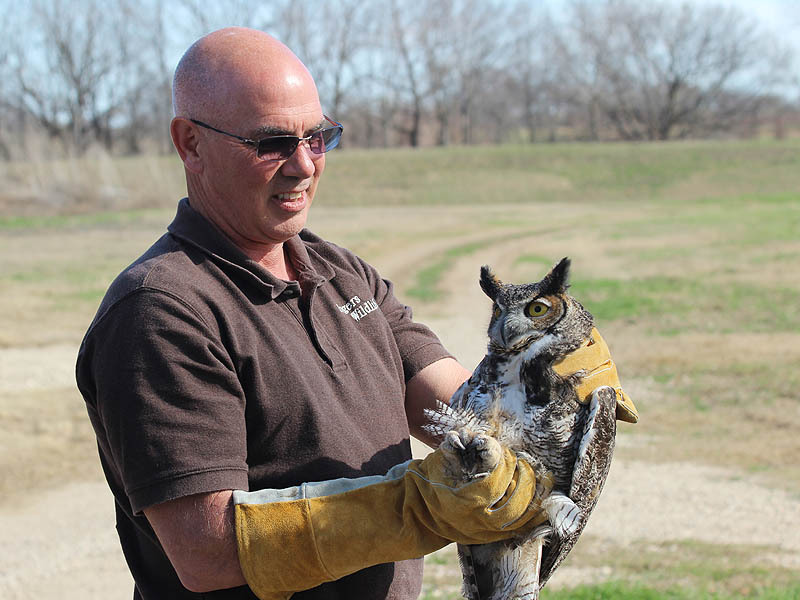 Heroic efforts are often required to bring wild animals back from the brink of death. Coaxing a recovery from injury or illness requires a deep commitment. It’s not enough to care—you have to invest yourself body and soul. 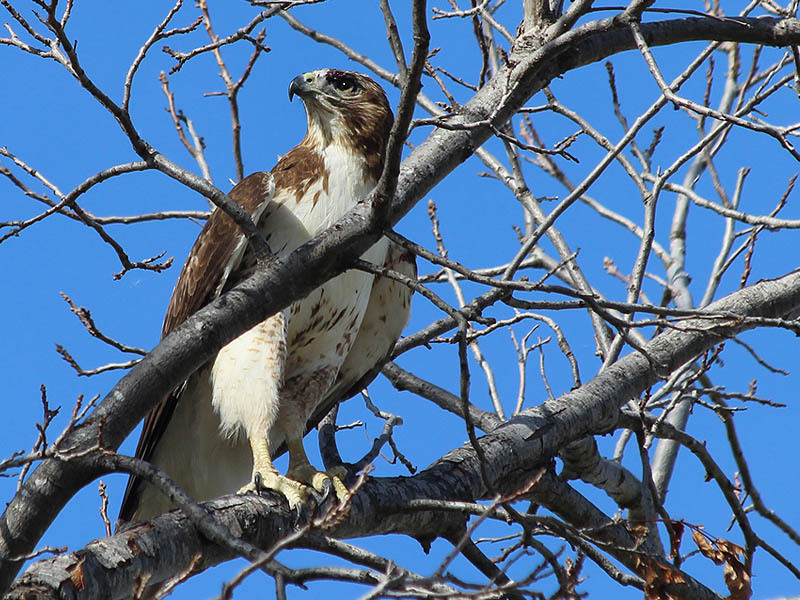 When a recovery is complete and the animal is healthy again, the preferred option—the right thing to do—is to return the animal back into the wild so that it can succeed or fail of its own volition. But, releasing these animals has to be a bittersweet experience for the rehabber. 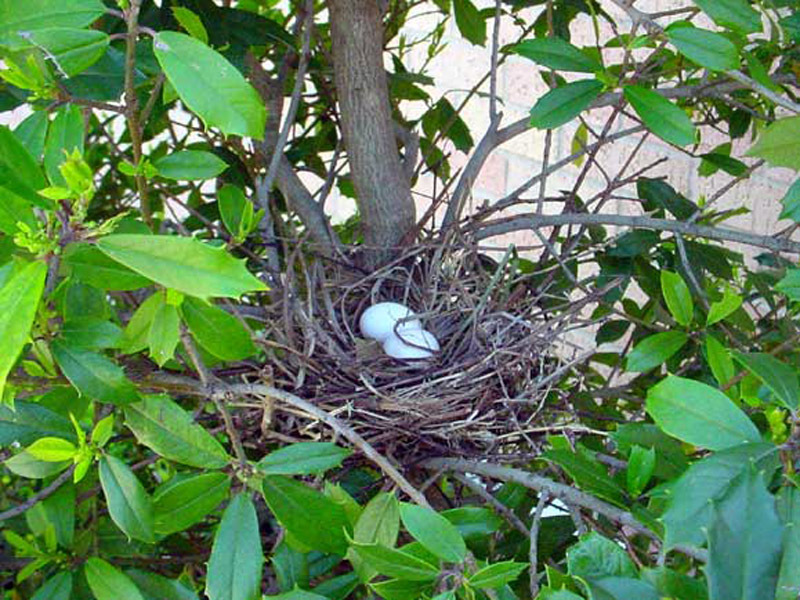 The outcome of reintroduction is not certain, and the caretaker knows this. The odds are often stacked against the newly released animal. An unusual environment, disorientation, unpredictable weather, deteriorated conditioning—all of these things can conspire against a recently freed animal. A rehabber knows that all of their hard work, all of their emotional investment, could be lost with an unfortunate turn of events. But, they do it anyways because they also know that it is in the best interest of the animal to live free as nature intended. Rehabilitation is a stopgap measure. It’s not meant to become a way of life. 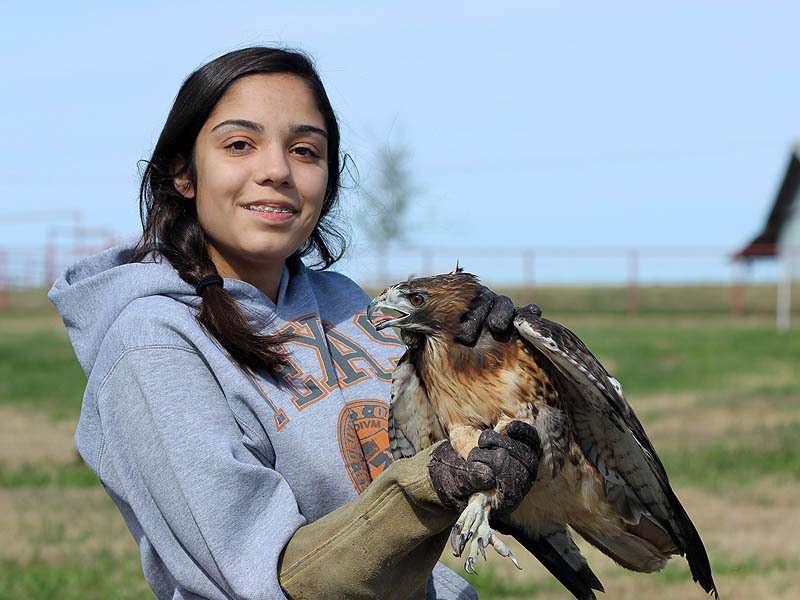 Two weekends ago my daughter and I were allowed the opportunity to experience the joys and pain of rescued animal release first hand. 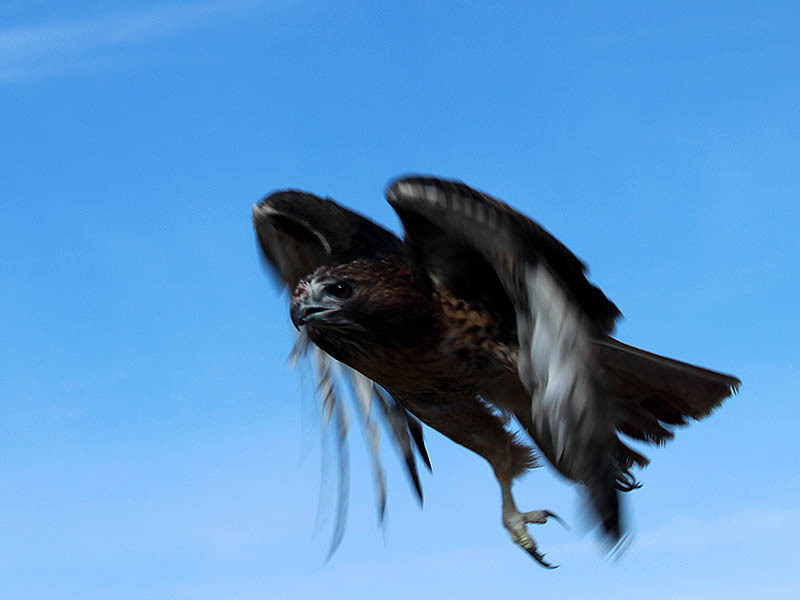 We were invited to accompany Kathy Rogers of Roger’s Wildlife Rehabilitation Center (RWRC) for a rehabbed raptor release. 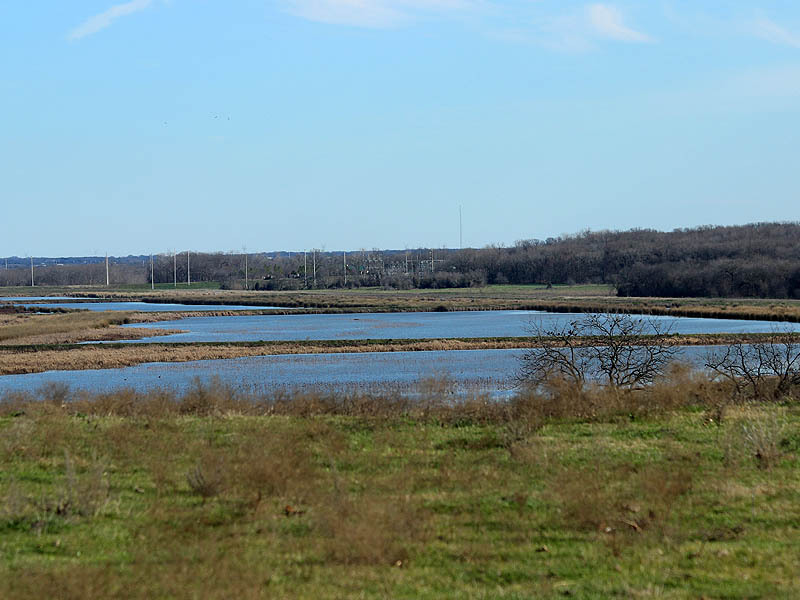 We traveled to John Bunker Sands Wetland Center south of Seagoville with an SUV packed full of rehabbed Red-tailed Hawks, Barred Owls, and Great Horned Owls. All ready to fly free again. 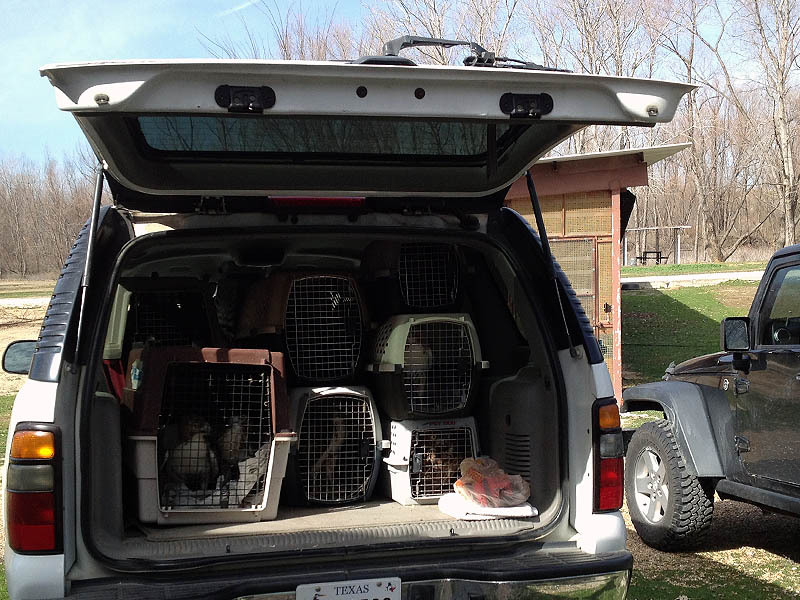 Loaded up with Raptors at the Rogers Wildlife Rehabilitation Center. 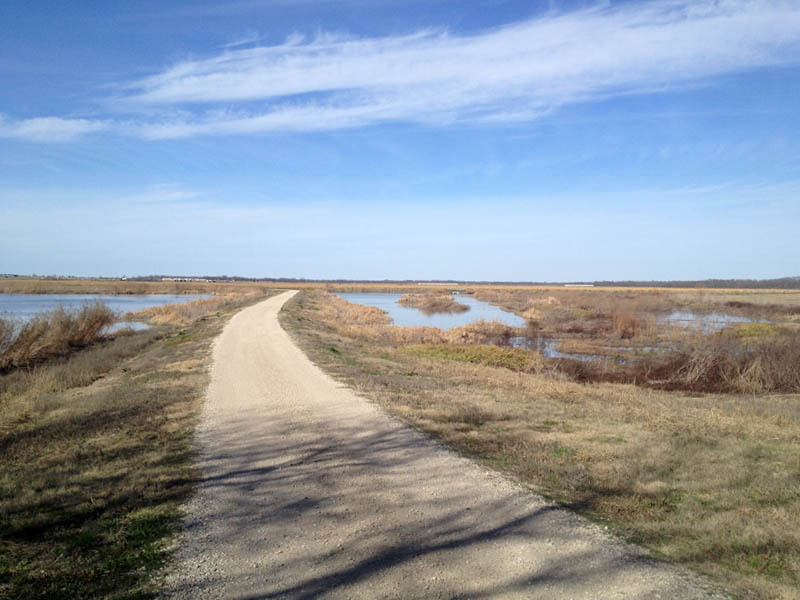 The John Bunker Sands Wetland Center. We were joined at this wonderful spot by a small group of instant friends brought together by a common interest in the well being of these birds. One couple we met that day had only visited Kathy’s place on a whim. 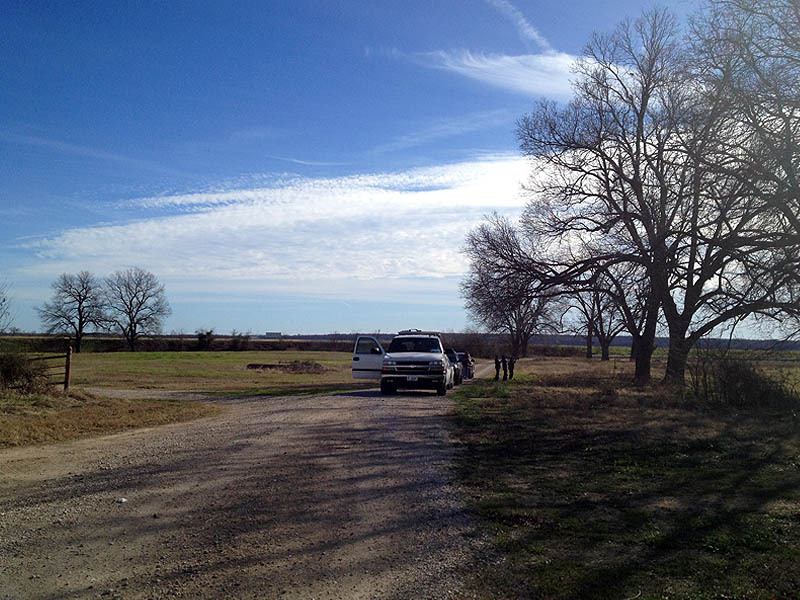 Up from Houston on other business, they found the RWRC on a guide map and stopped by spontaneously just to see what’s what. Serendipity invited them along for the raptor release. 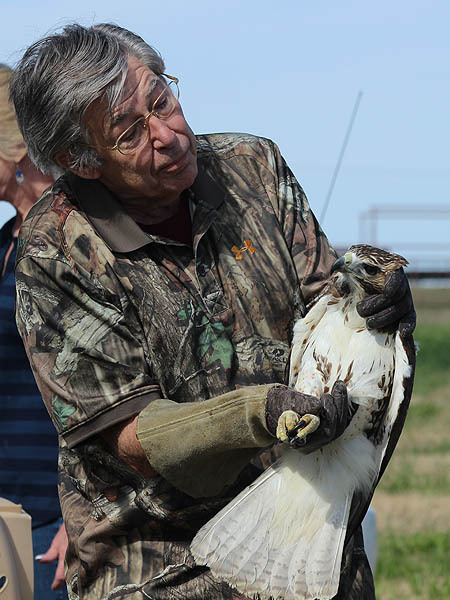 At the wetlands, each of us in turn, was allowed to handle and release one or more of these magnificent birds. 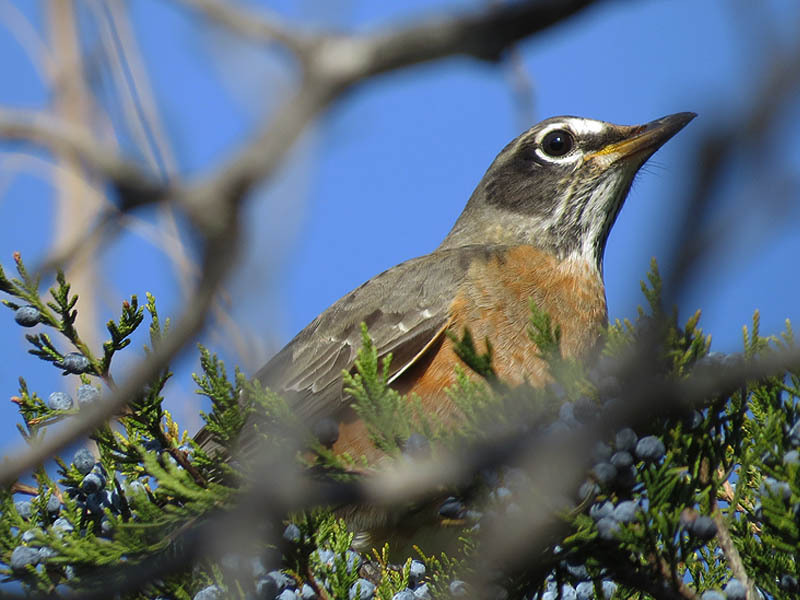 Opportunities for photographs abounded as these human-acclimated birds took their time getting their bearings. The birds often allowed us generous poses at close range. With wildlife photography there is no substitute for proximity and these once in a life time opportunities were eagerly taken advantage of. 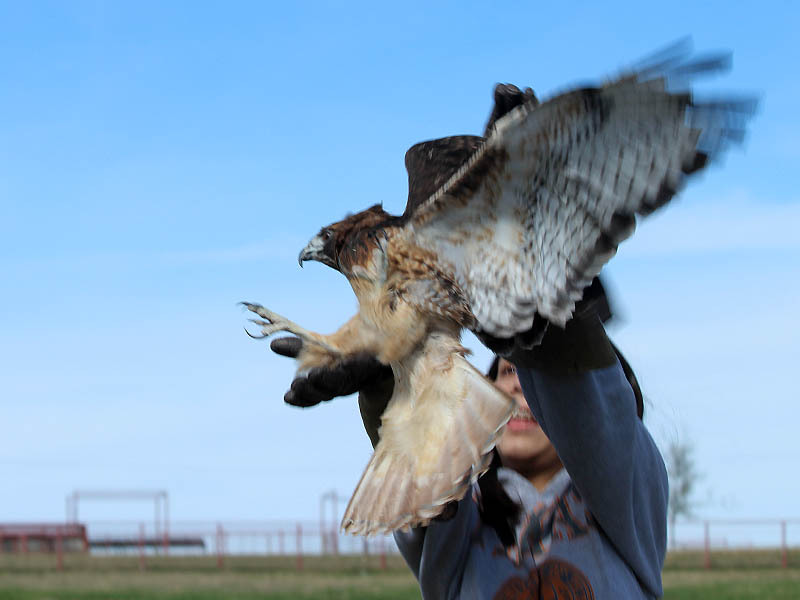 Releasing these beautiful birds back into the wild was a moving experience for everyone involved. There was joy and there were tears. But, even though the birds were gone—leaving us with an only odd assortment of empty cages—we all came away with much more than we had when we arrived. 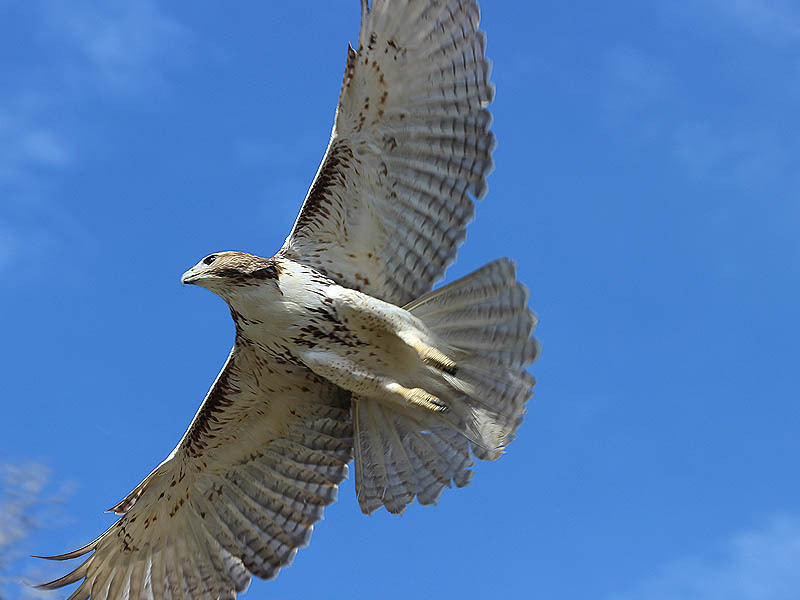 Red-tailed Hawks were the first to be set free. 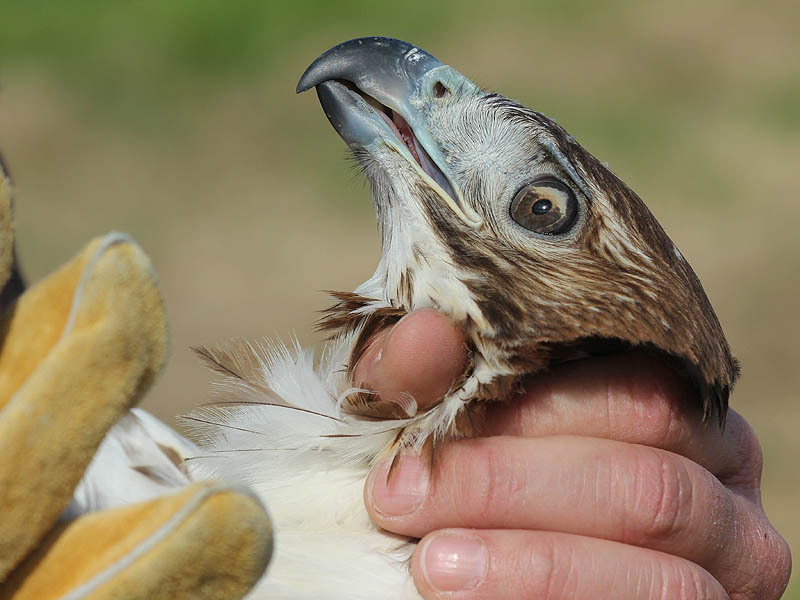 This hawk had a striking and unusual two-tone iris. The beginning of a second chance. 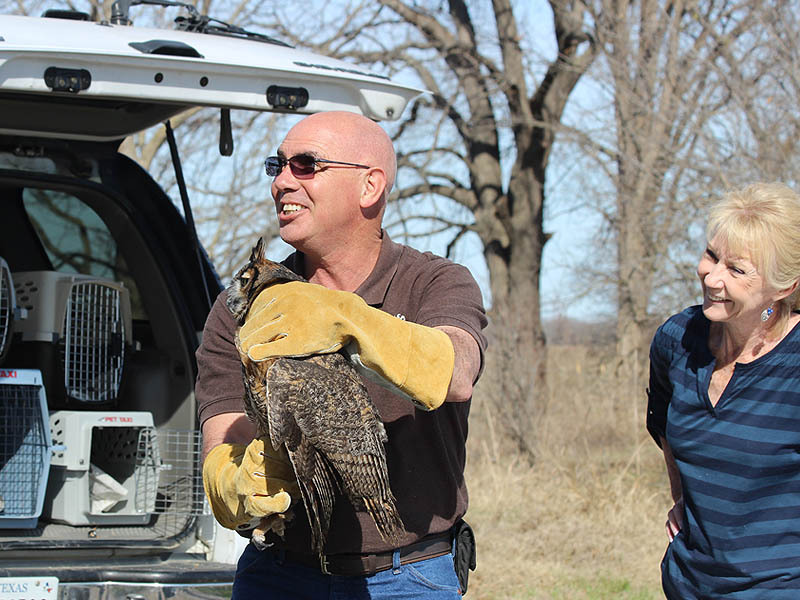 Next we released several Barred Owls. 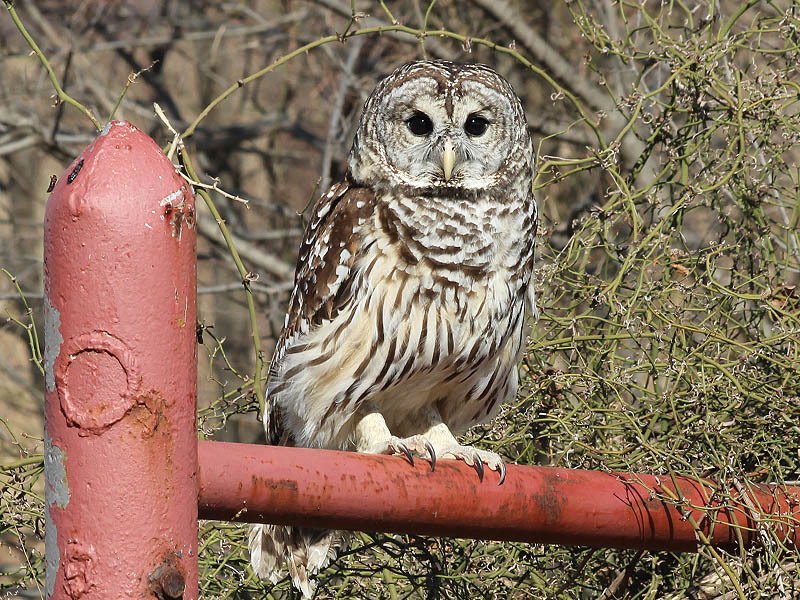 Barred Owls are beautiful birds. 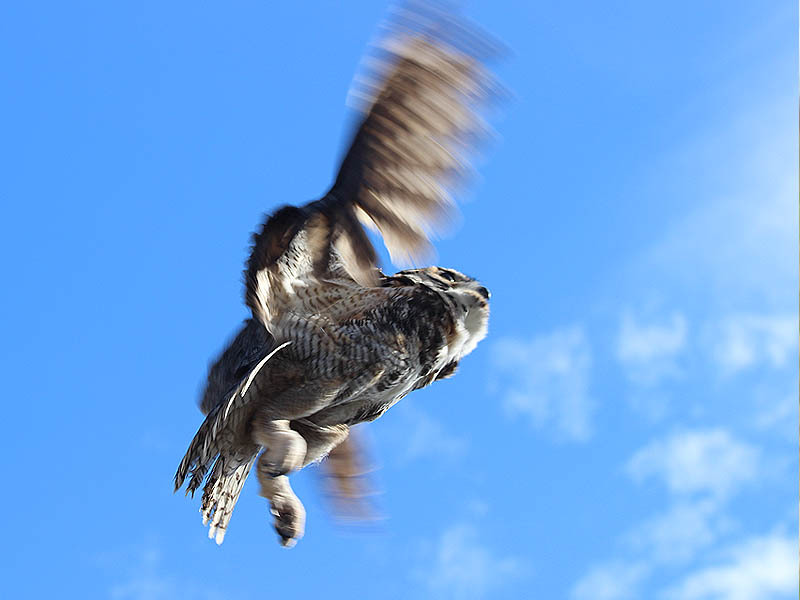 The owls often took a moment or two to get their bearings. 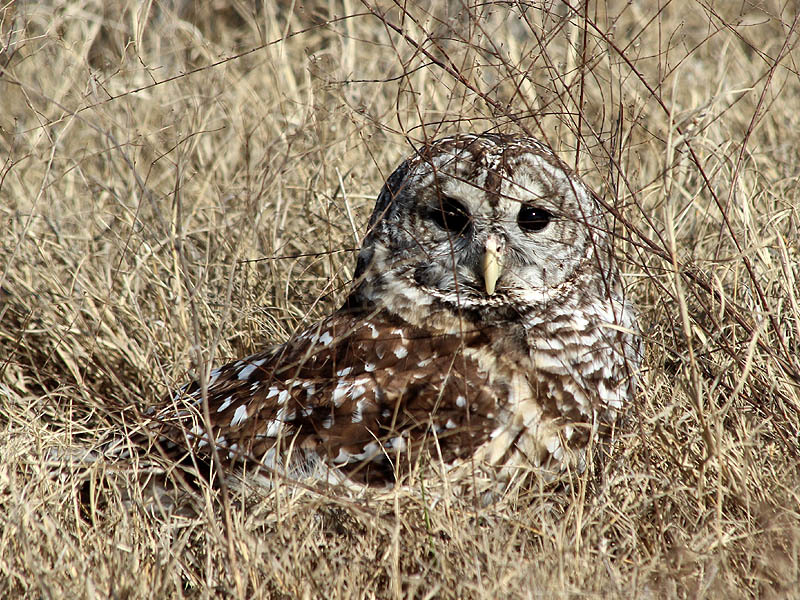 A Barred Owl on the ground. 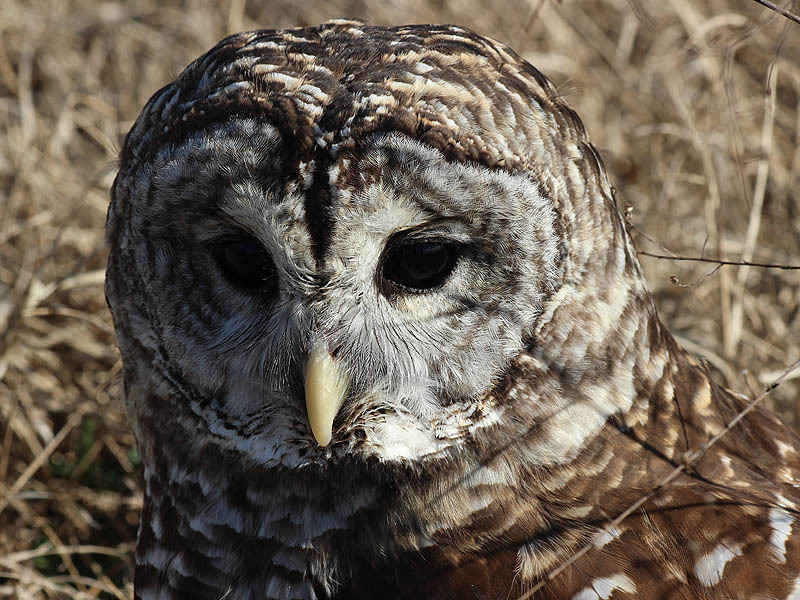 A recently released Barred Owl. 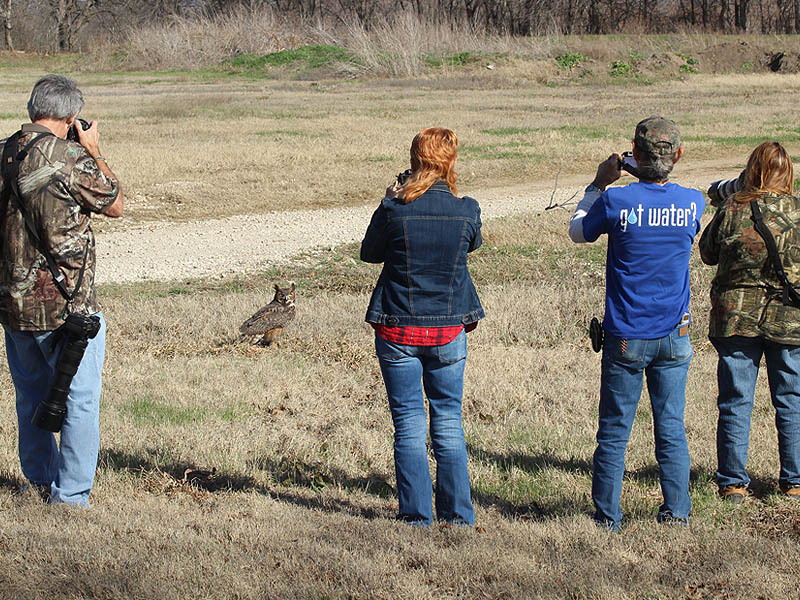 We finished the day by releasing Great Horned Owls. Soon to be returned to the wild. 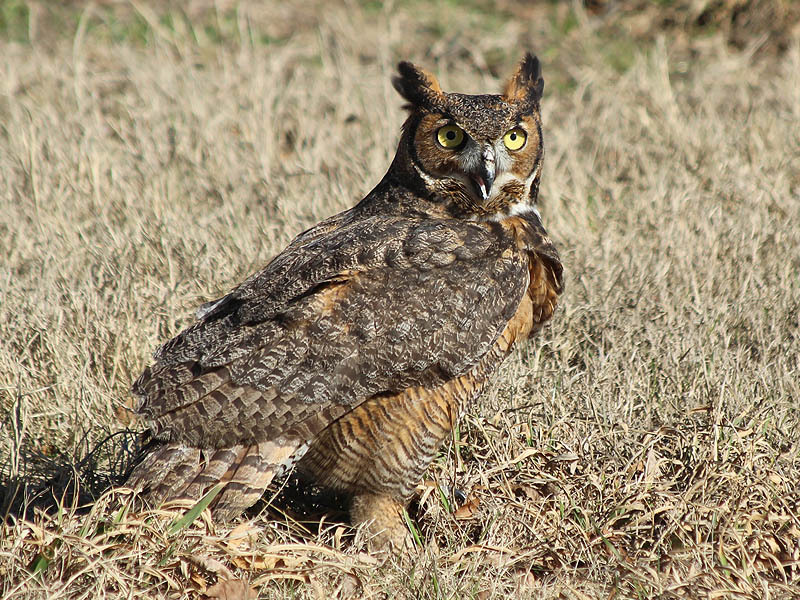 Compare the Great Horned Owls bright yellow eyes to the dark black eyes of a Barred Owl. 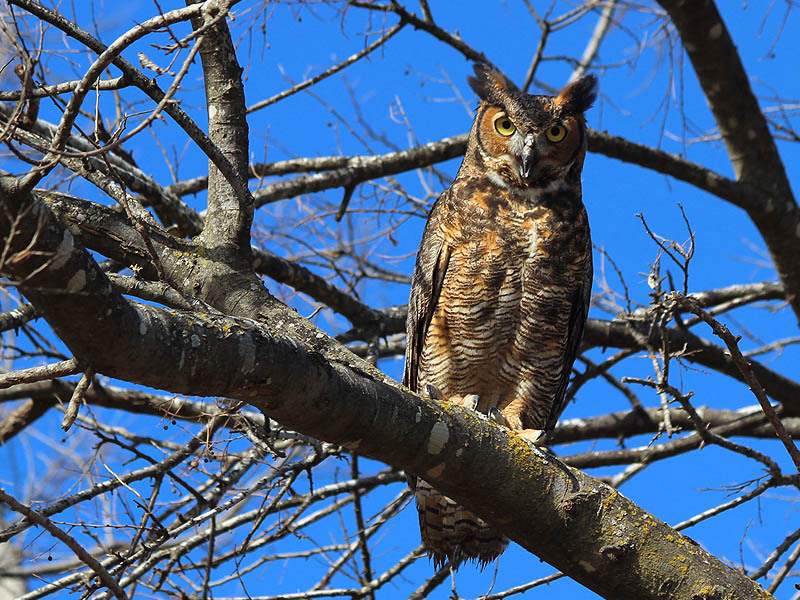 This grounded Great Horned Owls soon attracted the attention of a number of photographers. Lots of photographs were taken on this day. Beautiful photos and great story! So good to be free! Beautiful photos and story. 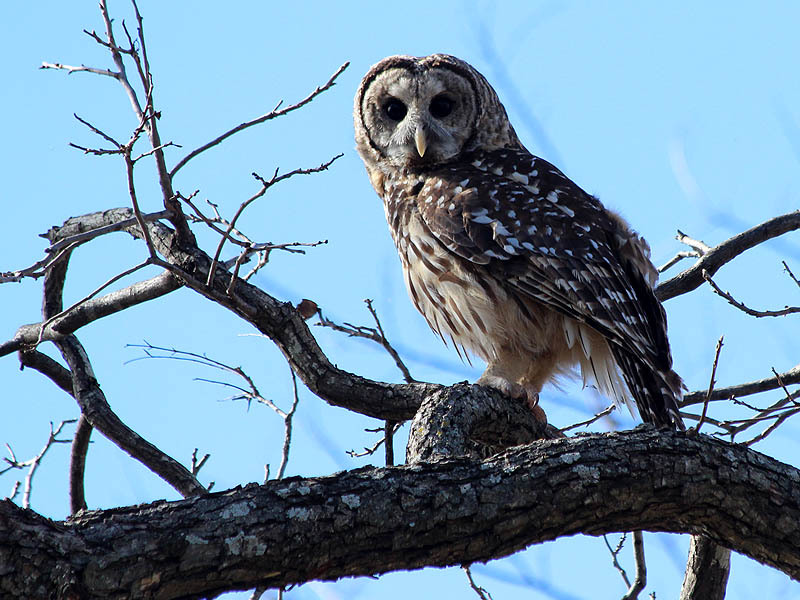 We have a family of barred owls living near us. 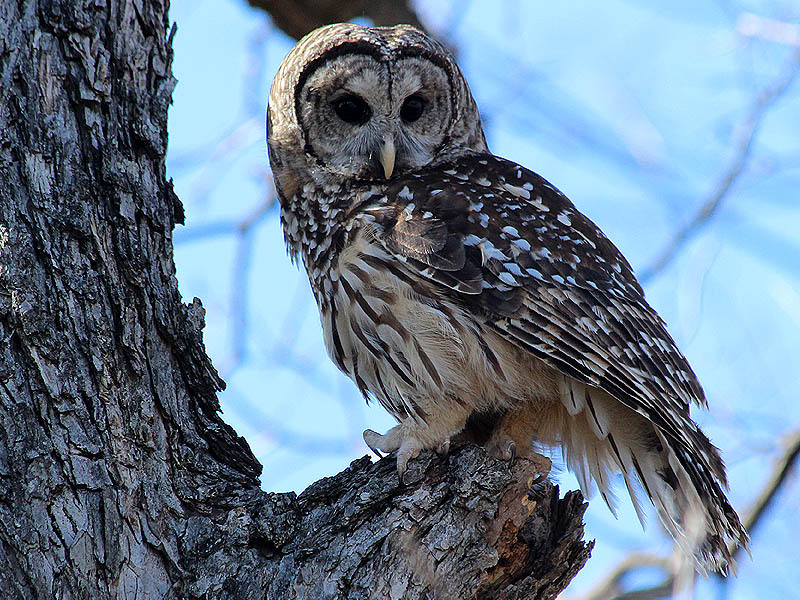 You can hear them calling just about any night, kind of a whooo with a growl at the end. Whooooorrrrrrr. 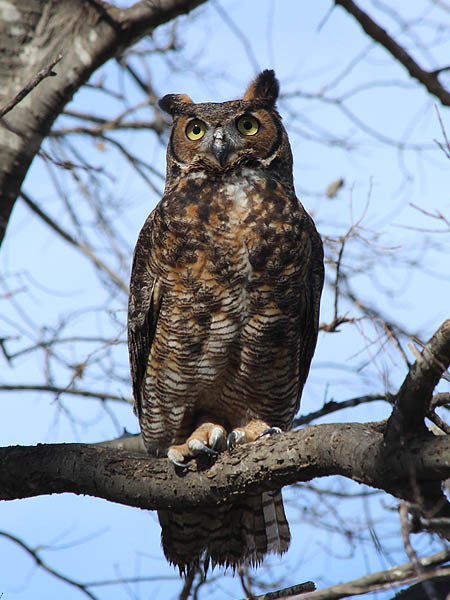 I knew it was an owl but one morning I saw one in a tree and got to watch it for about 10 minutes. Lovely birds.